On September 25, the State Department's Iran Action Group released a report detailing Iran’s support of terrorism, missile program, illicit financial activities, threat to maritime security, threat to cybersecurity, human rights abuses, and exploitation of the environment. “Today, the United States is publishing a full record of the Islamic Republic’s hostile behavior abroad and its repression at home beyond the continued threat of the nuclear program,” wrote Secretary of State Pompeo in the report’s introduction. “It is important for the world to understand the scope of the regime’s recklessness and malfeasance.” The following is the section on Iran's missile programs. Iran’s development and proliferation of ballistic missiles poses a critical threat to regional security and remains a significant challenge to global nonproliferation efforts. Iran’s proliferation activities have been a concern of the UN Security Council for more than a decade. UN Security Council Resolution (UNSCR) 1929, adopted in 2010, placed tough limitations on Iran’s ballistic missile program. The resolution prohibited Iran from undertaking any activity related to ballistic missiles that had the capacity to carry nuclear weapons, recognizing that such missiles would likely be Iran’s preferred method of delivering a warhead in the future. The Joint Comprehensive Plan of Action (JCPOA), which was finalized in 2015 to curtail Iran’s nuclear program, did not include any meaningful constraints on the regime’s ballistic missile program. Worse yet, as the JCPOA was implemented, UNSCR 1929’s strong language constraining aspects of Iran’s ballistic missile program was weakened. The JCPOA’s failure to address Iran’s ballistic missile proliferation remains one of its enduring shortcomings. With a weaker nonproliferation regime to constrain its activity, Iran has continued to defy international scrutiny as it pushes ahead with its ballistic missile program, conducting tests as well as ongoing research and development, and providing missile capabilities to its proxies in the region. Iran has the largest ballistic missile force in the Middle East, with more than 10 ballistic missile systems either in its inventory or in development, and a stockpile of hundreds of missiles that threaten its neighbors in the region. Iran is continuing to develop a range of solid and liquid propellant short-range and medium-range systems, and is exploring multiple pathways to expand its longer-range missile capabilities. Iran’s pace of missile launches and tests has not diminished following the implementation of the JCPOA and Iran continues to prioritize its missile force development. Iran has conducted numerous ballistic missile launches since the JCPOA has been in effect. The Iranian regime has failed for years to adhere to restrictions placed on its missile program by the international community. Iran has engaged in numerous missile launches since 2010 that were in violation of UNSCR 1929 and it continues to conduct launches that defy language in UNSCR 2231, which was adopted as part of the JCPOA. The Security Council has catalogued Iranian violations of UNSCR 2231 in its biannual reports since 2016. Prior to the adoption of 2231, Iranian violations of previous UNSCRs related to missile, nuclear, and conventional proliferation were well documented by various UN Panels of Experts. Iran’s ongoing missile tests demonstrate its desire to increase the accuracy and effectiveness of its capabilities. Continued investments in its space launch vehicle program have also been notable. 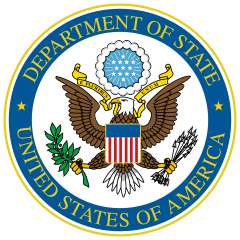 In an August 2017 letter to the UN Secretary-General, France, Germany, the United Kingdom, and the U.S. condemned Iran’s July 2017 launch of a Simorgh space launch vehicle as inconsistent with UNSCR 2231. Space launch vehicles use technologies that are virtually identical and interchangeable with those used in ballistic missiles, in particular Intercontinental Ballistic Missiles. Separately, the U.S. assesses that in January 2017, Iran conducted a launch of a medium-range missile believed to be the Khorramshahr. The Khorramshahr is designed to carry a payload of at least 1,500 kilograms and could be used to carry nuclear warheads. Its suspected range is at least 2,000 kilometers, which is far enough to reach some European countries. Iran is increasingly supplying missile technology to its regional proxies. Recent media reporting suggests that Iran is transferring ballistic missiles to Shia militias in Iraq, which targeted U.S. diplomatic facilities in Baghdad and Basra as recently as September 2018. In Lebanon, Iran is supporting Hizballah’s development of missile production facilities as well as advanced precision guidance systems for the group’s large missile stockpile. The international community increasingly recognizes we must take action to counter the further development and proliferation of Iran’s missile program. The U.S. relies on a wide range of tools to address this problem. On the multilateral front, the U.S. works with its partners to interdict missile-related transfers to Iran and to target Iranian missile proliferation activities in third countries. The U.S. and many of its closest partners also participate in the Missile Technology Control Regime and the Hague Code of Conduct Against Ballistic Missile Proliferation, two multilateral venues to help raise awareness of Iran’s missile development program, choke point technologies, and procurement strategies, and to press countries to take steps to impede Iran’s acquisition of missile technology. The U.S. also reviews thousands of visas annually to ensure that students, researchers, and other foreign visitors are not evading export controls and acquiring technological know-how that could benefit Iran’s missile programs. The U.S. and its partners also use sanctions authorities to penalize entities involved in or supplying technology to Iran’s missile program. In March 2017 and April 2018, the United States imposed sanctions against a total of 19 foreign entities for transferring equipment to Iran’s missile program under authorities provided by the Iran, North Korea, and Syria Nonproliferation Act. In July 2017, the United States designated 18 entities and individuals under Executive Order (E.O.) 13382 for supporting Iran’s ballistic missile program or otherwise facilitating the regime’s military procurement. E.O. 13382 provides authorities to target proliferators of weapons of mass destruction. In January 2018, the United States designated four additional entities in connection with Iran’s ballistic missile program under E.O. 13382. In May 2018, the U.S. Department of Treasury designated five Iranian individuals for providing ballistic missile-related technical expertise to the Houthis. The individuals were also responsible for transferring weapons to Yemen on behalf of the Islamic Revolutionary Guard Corps-Qods Force (IRGC-QF). The U.S. will continue to aggressively employ sanctions against Iran’s missile program as we implement the President’s new strategy.